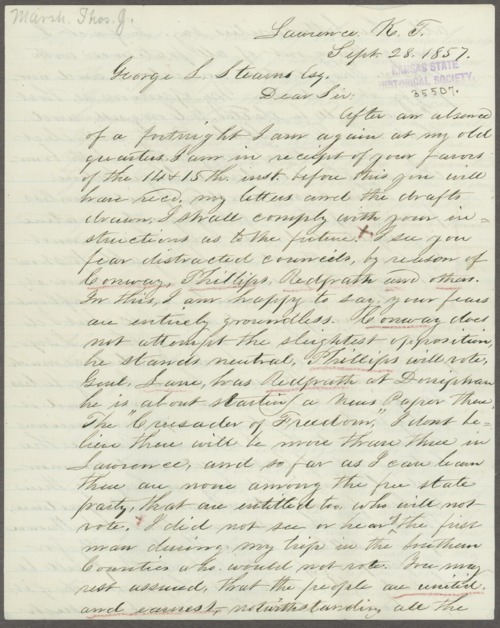 The following is a letter dated September 28, 1857, from Thomas J. Marsh to George L. Stearns that attempts to convince Stearns that the territorial judges will rule in favor of the Free State party. Marsh also mentioned the territorial elections and the voter fraud in which Missourians would most likely engage. Marsh also discussed encroachment on the Delaware Indian reservations by Missourians, who were attempting to stake land claims before the reservation was legally open to settlement. People - Notable Kansans - Parrott, Marcus J.